Pesto: 1. Take the washed basil leaves and chop them in the food processor in 3~4 small batches. 2. Add in the cheese, pine nuts, garlic and sun-dried tomatoes into the food processor with the chopped basil still in. 3. Add in the olive oil and slowly chop the mixture for 30~40 seconds. 4. Taste the mixture and add in additional salt to taste (Parmesan cheese is salty already). 5. Pesto can stay in a clean glass or Corning Ware container in the frig for a few days only. 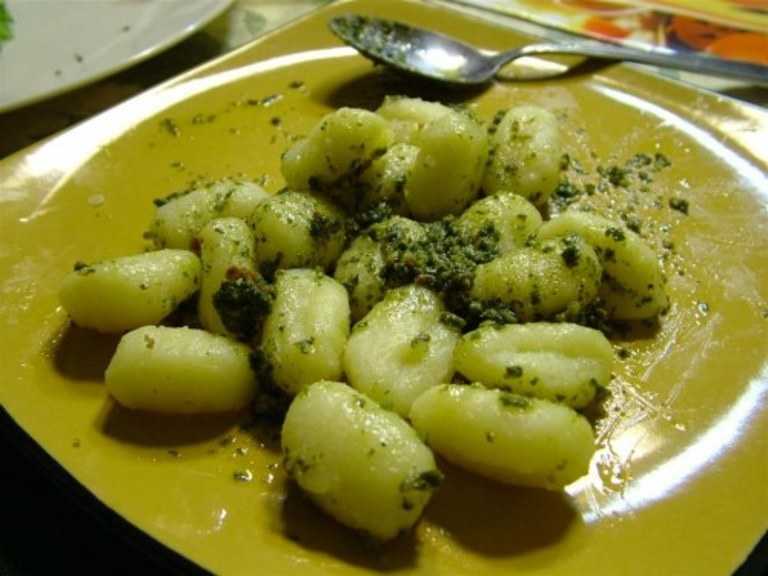 Gnocchi: 1. Take the package of gnocchi and put into lightly salted boiling water. 2. Stir until individual gnocchi starts to float (about 1 to 3 minutes) 3. Mix in the freshly made pesto sauce to taste and ENJOY!